Since yesterday (March 4th) dawned so wet, we made a beeline from Whakatane to Warkworth, the gateway to Northland (1 hour north of Auckland). Today however, we lucked out with the weather so we decided to check out the snorkelling possibilities around Goat Island, a Marine Reserve near Leigh. We checked out of the motel in Warkworth and drove 23 kms to Leigh and called into the Goat Island Dive shop. Goat Island Dive are outfitters for scuba diving, snorkelling, and even kayaking. They have a full range of wetsuits, flippers, and gear for hire for anything from a few hours to a full day. We were fitted for wetsuits, masks, flippers and snorkels then after a brief map orientation on the best places to snorkel we set off for our adventure. 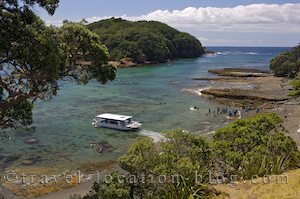 Arriving at Goat Island we were surprised at just how busy the place had become - it used to be a popular holiday destination for a few Aucklanders and Northlanders, almost a secret hidden gem but obviously the secret is out! Once we were suited up with our gear, we headed for the water - and were surprised for the second time that day ... the water was freezing!! But being as brave as we are we took the plunge anyway and soon got used to it. Goat Island is a marine reserve and it's as though the resident fish know this fact as they appear to have no fear of our relatively large black human forms and continue going about their leisurely business. The number of fish in and around the reserve fluctuates from time to time and today there weren't a lot. We saw a few Blue Maomao, large Snapper, Parore, Trevally and a few other unidentified fish but not in large schools. After about an hour or so we took to dry land again and enjoyed a walk along the beach before heading back to Goat Island Dive to return our gear and continue north towards the Bay of Islands. We had a little over 3 hours of travelling ahead of us to get to Paihia, allowing for a few stops along the way. We pulled into Paihia and checked out some options for dinner before heading to our accommodation which was out near Haruru Falls. The views from Cook's Lookout Motel were just stunning and in sync with their advertising claims of million dollar views - yes they are!! We chose to have dinner at La Scala Restaurant in downtown Paihia and were not disappointed there either - the food was fabulous, on time, cooked to perfection, and the service was great!